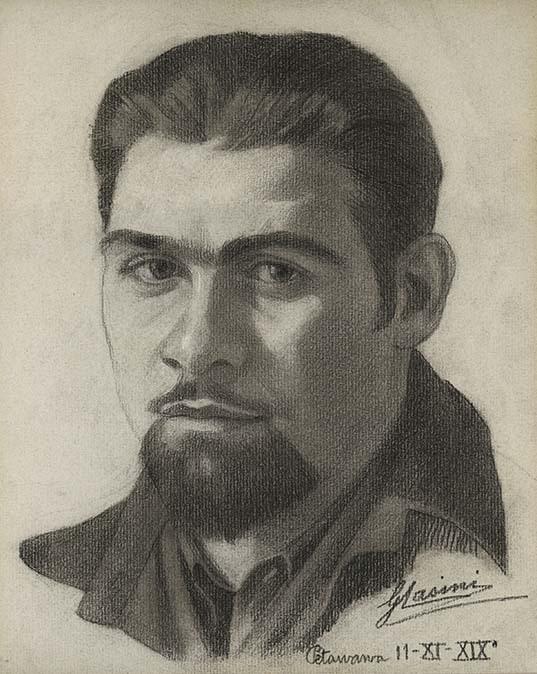 This charcoal sketch of Osvaldo Giacomelli was created by fellow internee Guido Casini in Petawawa Internment Camp. On the lower right hand corner, we see the artist's signature followed by "Petawawa II-XI-XIX". This appears to be the fascist date for November 11, 1941. Guido Casini was an artist. He was known in the Italian Canadian community of Montreal having worked on the sculpture for Giovanni Caboto (John Cabot) and assisted with the fresco featuring Benito Mussolini in the Madonna della Difesa church. In Petawawa Internment Camp, both he and Guido Nincheri did coal sketches of fellow internees. Vincenzo Poggi completed sketches as well as paintings while in camp. This photograph belongs to a collection owned by Italian Canadian internee Osvaldo Giacomelli. Previous to his death, he had spoken on the record about his internment to journalists and academics. Some suggestion has been made that Giacomelli was a fascist supporter and Mussolini-adherent. He was one of the longest-serving of the Italian Canadian internees, released on May 29, 1945. Giacomelli himself felt that he was wrongfully interned, and sued the Government of Canada in 2005. When Giacomelli died in March of 2006, his case was still unresolved.